Contributed by Mary Addison Hackett / Ask anyone here what initially brought them to the desert and almost everyone will say, “I love the desert,” followed by a brief declaration of prolific love for the community of people they met upon arrival. That’s the standard order. We come for the landscape and stay for the community. But sometimes the community comes first, and we learn to love the landscape along the way. 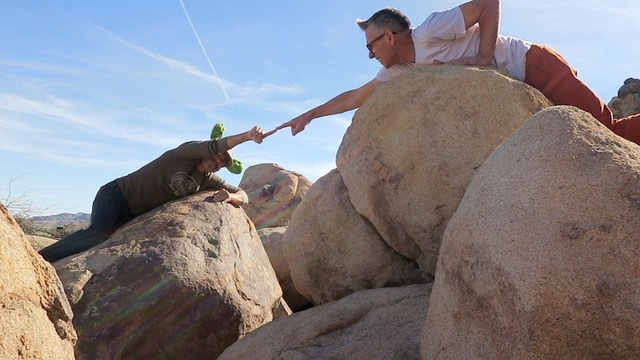 Located a few miles east downtown Joshua Tree and slightly off the beaten track is BoxoPROJECTS, a multi-program arts initiative run by Bernard Leibov, and BoxoHOUSE, the residency program that serves as an outpost for artists to develop ideas related to place, community, and the environment. 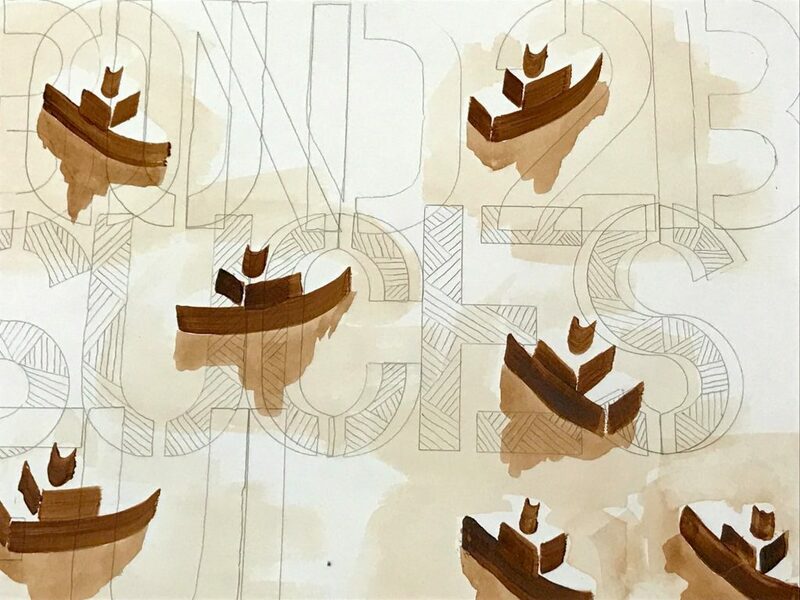 As part of the residency program and in keeping with the mission of fostering community, there is an exhibition, artists’ talk and/or reception for each invited artist. For reasons that may have more to do with social anxiety than anything else, I love attending artists’ talks and intimate receptions. Chit-chat is kept to a minimum and I can focus on the art and the artist. 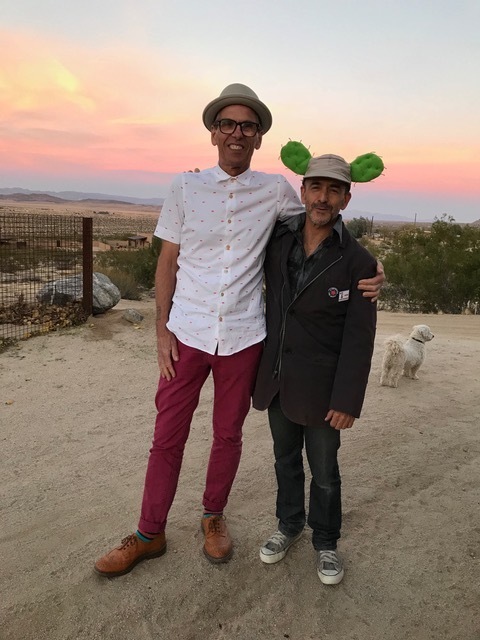 The BoxoHOUSE compound overlooks the desert and is nestled among boulders and desert vegetation— which leads me to the most recent exhibition titled, Collab, a collaborative project between Bernard and artist/curator in-residence, John Plowman. Both artists have extensive curatorial backgrounds, way too lengthy for this humble post, but suffice to say, John currently runs Beacon, a multi-project arts initiative based in the UK, and prior to moving to the desert and founding BoxoPROJECTS, and co-founding the Joshua Treenial, Bernard served as deputy director of the Judd Foundation in New York. The range of works in Collab explores some of ways in which the collaborative process unfolds, with the focus being on sense of place, a subject close to my own heart. Relationships to place can be complex: one’s childhood memories of place, a sense of belonging to a community, and in the case of our desert environment, a near-mythical relationship to the land often figures into the narrative. 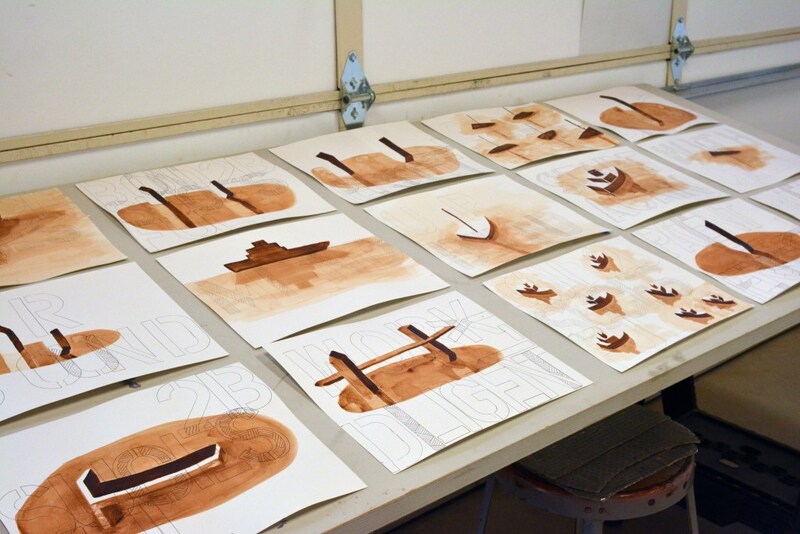 The work presented was smart, approachable, and charming. 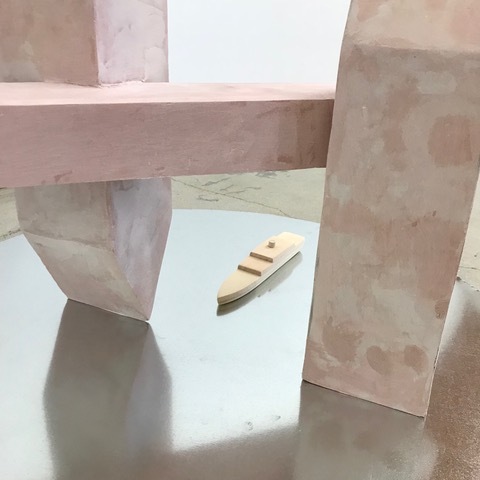 Included in the exhibition were a series of drawings that had been swapped back and forth, sculpture created individually that hinged on an ongoing dialogue, and videos for which the physical collaborative activity was integral to its making. Not to be cliché, but without the journey, there’s no destination. There’s also the acknowledgement that collaboration includes silent agreement with the land, and learning to live in one’s environment, cactus spines and all. The result was a cohesive and thoughtful exploration of the process that as artists, curators, and everyday civilians we encounter along the way. 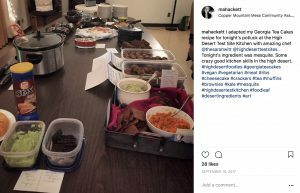 Sarah Witt, is an artist and organizer of the High Desert Test Kitchen (HDTK) a series of monthly potlucks done in association with Andrea Zittel’s High Desert Test Sites. 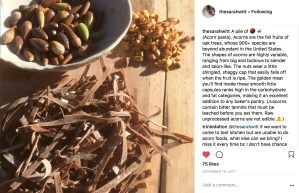 I became acquainted with Sarah when I saw an Instagram post announcing that she was looking for Mesquite pods and would be happy to trade some services in return for harvesting on site. There was a bit of a misunderstanding on my part since at the time I couldn’t differentiate between a Mesquite, a Palos Verde, or a Mexican Bird of Paradise (whose pods are poisonous, btw) and after figuring out that she did not need a truckload of pine limbs, we sat down in my kitchen over a glass of water or two and discussed our interest in integrating life and art, ways of the desert, and food. The HDTK meets monthly at our community center. For the potluck Sarah chooses a local, seasonal ingredient and encourages everyone to harvest responsibly (or purchase if harvesting is a challenge) and bring a dish featuring the ingredient. You can also bring a bag of chips or show up empty handed. No one judges. The event begins with some minor socializing followed by a brief informative talk about the ingredient from Sarah. Those of us who prepared a dish cop to what we made and anything of interest in the preparation. Last month, Sarah whipped up some butter on the ride over by rigging a jar of cream outside the car window; I made a rolling pin out of an appropriate-sized pine limb which aided in rolling out a pizza crust, and Martha Burr, another participant fashioned a “stone pine collins” cocktail using pine syrup and gin, complete with river rocks and sprigs of pines as garnish. The event is free and everyone is welcome. Third Monday of the month. 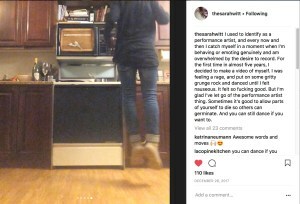 For more about Sarah and her projects in the desert, please check out this interview conducted by Jodie Cavalier in Drain. 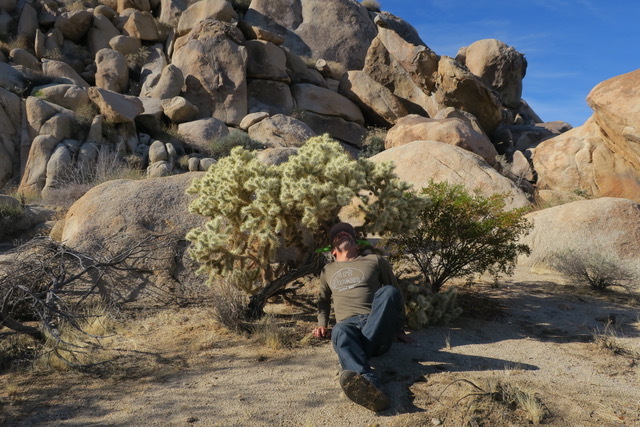 Sure, there’s no shortage of paintings depicting Joshua Trees, ironically or not, but the happenings centered around community and the environment are the real magic here.